A young tennis player works at the prestigious and exclusive "Red Oaks" Country Club during the summer between his sophomore and junior years of college in the 1980s. A&E Network introduces the Robertsons, a Louisiana bayou family living the American dream as they operate a thriving business while staying true to their family values and lifestyle. "Duck Dynasty" premieres Wednesday, March 21 at 10PM ET/PT on A&E. Ask anyone in Louisiana and they'll tell you that the bayou state's favorite first family doesn't live in the governor's mansion but in the backwoods, where the Robertsons' rags-to-riches story is still unfolding. A homegrown mom-and-pop operation, Duck Commander has become a sporting empire by fabricating top-of-the-line duck calls and decoys out of salvaged swamp wood. This newly minted multimillionaire family is kept in line by business-savvy Willie, who runs Duck Commander with the help of his brother Jase, their respective wives Korie and Missy, patriarch and founder of the company, Phil, and uncle Si. Together they run a booming business that employs half their neighborhood, but at the end of the day, you can find the whole family around matriarch Miss Kay's dinner table. Season 11, Episode 16 - "End of an Era, Part 2"
Willie, Phil and Jase take a road trip in an attempt to re-create an old duck call for Si's retirement present. Season 11, Episode 15 - "End of an Era"
The family plans a party for Si, who decides to retire and pursue a music career. Season 11, Episode 14 - "Dance Dads"
Willie, Korie, Jase and Missy receive dance lessons from Sadie to prepare for Reed and Rebecca's upcoming weddings; Jase's failure to renew his ordainment in a timely manner threatens his plan to perform Reed's wedding ceremony. Season 11, Episode 13 - "Disappearing Acts"
Willie and Jase lose Si's teacup, then are put through great lengths to find it; Jep is pressed into service as a magician when entertainment plans for Gus's first birthday party fall through. Season 11, Episode 12 - "Rowdy's Big Day"
Rowdy officially becomes a Robertson after his adoption is finalized; Jase enjoys his first massage more than he expected. Season 11, Episode 11 - "The Campfire Diaries"
The family relives old memories at its childhood summer camp and attempts to repair a tennis court Willie built 20 years earlier; while at the camp, Jep attempts to pass a lifeguard swimming test he failed as a teenager. Season 11, Episode 10 - "Carpnado"
Jase and the guys take to Monroe's waters to battle an invasion of Asian carp; Willie and Si have to run Willie's Duck Diner with most of the staff out sick. Season 11, Episode 9 - "When Doves Fry"
Jase and Jep make a deal with Mia and Merritt to get them to go dove hunting; Si tries to make some extra money by starting a West Monroe tour. Season 11, Episode 8 - "Fishful Thinking"
Jase enlists the help of legendary angler Bill Dance in the hopes of winning the inaugural Duck Commander Fishing Tournament; Willie's vanity over his graying beard leads him to make a questionable decision. Season 11, Episode 7 - "Drive-In Revivin'"
Willie faces the challenge of coming up with a romantic gesture for Korie without spending any money; Jase and Missy compete to see who can find a girlfriend for Mountain Man. Season 11, Episode 6 - "Sleep Cover"
Willie and Jep step in to supervise Bella's sleepover while Korie is away in Africa; Jase takes Si, Martin and Godwin for a round of night golf. Season 11, Episode 5 - "Good Willie Hunting"
While many of the guys' wives and children are in Africa doing charity work, Willie and Jase get into a debate over tracking ability which leads to a challenge--can Jase and Si track and capture Willie and Jep? Season 11, Episode 4 - "Uneasy Rider"
Willie puts Little Will on a budget for his first car but it backfires when Will decides to get a motorcycle instead. Jase and the guys are inspired to design a product using zip lines that will revolutionize duck hunting. Season 11, Episode 3 - "Razing the Snakes"
Jase, Jep, Si and Cole try to fight back a growing population of cottonmouth snakes on Phil's property. Meanwhile, Willie uses his business expertise to help Rebecca improve her clothing store. Season 11, Episode 2 - "Automation Frustration"
Season 11, Episode 1 - "The West Monroe Wing"
Willie and Jase run against each other to become president of their neighborhood HOA. Jep, Jess and Miss Kay work on a Duck Commander themed display for the local zoo. Season 10, Episode 14 - "Techs and Balances"
Willie thinks his kids have been spending too much time on their phones and other devices so he initiates a "No-Tech Week," but when he has to participate too it ends up being harder than he thought. There's a lice outbreak at Duck Commander forcing the guys to try to stop it before it spreads any further. Season 10, Episode 13 - "Bro'd Trip"
Jase accompanies Willie on a business trip to Arkansas to pitch a new product and has unorthodox sales strategies. Back in Monroe, Jep and Si have to track down an important item of Willie's that they accidentally shipped out. Season 10, Episode 12 - "Here Comes the Son"
After leaving school to pursue music, Jase feels that Reed needs some structure in his life, so he hires him to take his place at Duck Commander. Meanwhile, Korie tries to help Willie lower his blood pressure by putting him on a vegetarian diet and exercise program, much to Willie's chagrin. Season 10, Episode 11 - "Whole Lotta Bull"
The guys enjoy a one-day rodeo fantasy camp where they learn the ins and outs of riding, roping and clowning. Meanwhile, when Kay's dog Bobo gets a new girlfriend, Kay drags Willie to meet the dog's owners to help determine if she comes from a good family. Season 10, Episode 10 - "Children of the Cornbread"
When the Robertson brothers debate which of their wives makes the best cornbread, it escalates into a full-on cornbread cook off. Meanwhile, when Jep, Martin, and Godwin play a practical joke on Uncle Si, it ends up being Si who has the last laugh. Season 10, Episode 9 - "Sadie's Choice"
Willie takes Sadie on a tour of a local college in hopes of convincing her to stay nearby after her impending high school graduation. Meanwhile, John Luke and Mary Kate try to prove to Phil that they haven't lost their Robertson roots while away at college. Season 10, Episode 8 - "Bingo Star"
Willie accompanies Kay to a local bingo tournament and gets seduced by the game, eventually embarrassing himself and Kay with his enthusiasm. Meanwhile, Jase and Jep prove to the younger generation that there are fun things to do outdoors in the mud. Season 10, Episode 7 - "There Will Be Flood"
When a large storm hits Monroe, most of the adults head to Phil and Kay's to help protect their house from flooding while Jess, Sadie, Rebecca and Cole babysit the kids. Meanwhile, Jep, Si, Martin and Godwin try to protect the Duck Commander inventory from a leaking warehouse roof. Season 10, Episode 6 - "Half in the Bag"
After Si has started moonlighting as a grocery bagger, the guys show up at the store and their teasing inadvertently causes Si to lose his job and his chance to enter a local bagging competition. To make up for it, they create their own competition to help Si get his job back. Meanwhile, Korie bribes Willie to get some necessary dental work done. Season 10, Episode 16 - "Half In The Bag"
Season 10, Episode 5 - "Wild Wild West Monroe"
When Jase and Jep get into an argument over which of them is the rightful heir to their grandfather's old rifle, they decide to settle the argument with a marksmanship contest. Meanwhile, Willie and Korie help Rebecca prepare for her trip to Taiwan with her new fiancee by rehearsing the customary Taiwanese engagement ceremony. Season 10, Episode 4 - "Father Knows Pest"
The tables are turned when the HOA comes to Jase for help to rid the neighborhood of a menacing beaver. Little Will has just gotten his learner's permit, and Willie and Si argue over which of them is the better driving instructor. Season 10, Episode 3 - "A Decent Proposal"
On a trip to New York, Jase's son Reed proposes to his girlfriend, which inspires his father to fan the flames of romance back home with Missy. Meanwhile, when Sadie asks Willie to be a guest lecturer at her business class, things get derailed when Uncle Si tags along and uses it as an opportunity to promote his new invention. Season 10, Episode 2 - "Statue of Imitations"
When Willie asks a local chainsaw artist to make him a statue, he gets a big surprise when it's revealed that the statue is of an unlikely subject -- Willie himself. Meanwhile, Jep and Jessica attempt to help Kay with her hoarding by selling some of her items online, but things take a turn when Kay begins buying more stuff than she sells. Season 10, Episode 1 - "Willie & Korie's Anniversorry"
The Robertsons celebrate Willie & Korie's 25th anniversary and Willie and Korie reveal a big secret that makes the party take a dramatic turn. Elsewhere: Jase gets a parking ticket and blames Uncle Si. Season 9, Episode 13 - "Jep's Funniest Moments"
Season 9, Episode 14 - "RV There Yet? (2)"
Season 9, Episode 12 - "RV There Yet? (2)"
The Robertson family takes a road trip to Liberty University where they will drop off John Luke and Mary Kate for their first year of college. Along the way, they stop in Nashville to visit Willie's friend Colt Ford. Meanwhile, back in Monroe, River wants to make his own ninja movie and the family all play a part. Season 9, Episode 11 - "100th Episode: RV There Yet? (1)"
Season 9, Episode 10 - "Toad to Perdition"
The wives try to spend more quality time with their men by challenging Willie and his brothers to a ``frogging'' competition; Si and Miss Kay interrupt John Luke and Mary Kate's preparations for college. Season 9, Episode 9 - "Van He'llsing"
Missy and Jase begin to question Reed's choices after he buys an old van to advance his music career; professional grappler Kurt Angle helps prepare River for a competitive wrestling league. Season 9, Episode 8 - "Pie Hard"
Willie and Alan ask Miss Kay to hand over her secret recipes in order to get her bakery off the ground; the workers in the duck call room drive to Mississippi for fried green tomato sandwiches. Season 9, Episode 7 - "Heroes Welcome"
Two wounded veterans are surprised with a trip to Louisiana to appear in an episode of the show; the Robertsons raise awareness about wounded soldiers by staging a special event. Season 9, Episode 6 - "Renaissance Men"
The family holds a Renaissance Fair for Godwin's birthday. Season 9, Episode 5 - "Alan in Charge"
Alan is hired to work at Duck Commander, but his management style causes problems. Season 9, Episode 4 - "Drone Survivor"
When Jase and Phil make a bet about whether or not human beings in a duck blind are visible from the air, Jep buys a drone copter to get a "bird's eye" view, but ends up losing it in the process. Meanwhile, Willie brings Si to the chiropractor for an overdue spinal adjustment. Season 9, Episode 3 - "Ball in the Family"
When Willie's old rival Phillip McMillan challenges him to a game of dodgeball, Willie recruits his family members to settle a score once and for all. Meanwhile, Si thinks his cat is cheating on him with another family, so he recruits Miss Kay and Mountain Man to help find out. Season 9, Episode 2 - "Flock and Key"
Si's nephews help him transport a storage container to his backyard, but things take a turn when Jep becomes locked inside the unit; a clueless Jase helps Mia prepare for her cheerleading competition. Season 9, Episode 1 - "Inlawful Entry"
Missy's father convinces Jase to take him on a quail hunt; Willie helps John Luke start his own snow cone business. Season 8, Episode 9 - "John Luke Gets Hitched"
John Luke Robertson and Mary Kate McEacharn are about to get married. Guests from all over the world show up for the momentous ceremony. Season 8, Episode 8 - "Pit Perfect"
When Duck Commander sponsors a NASCAR race, Jase and the guys attempt to work as a pit crew; Willie and Korie challenge John Luke and his fiancée to a tennis match. Season 8, Episode 7 - "The Ducket List"
After Uncle Si has a brush with death, he decides to create a bucket list; Kay tries to prove that she graduated from high school. Season 8, Episode 6 - "Bachelor Party Blowout"
Martin's bachelor party celebration at a hunting cabin gets interesting when the guys uncover an assortment of antique black powder weapons; Kay's dream of owning a petting zoo comes true. Season 8, Episode 5 - "Pranks for Everything"
Office jokesters Willie, Jase and Jep are volunteered to help Alan at the church; Korie gives Kay a surprise class with famous artist Pierre Henri Matisse. Season 8, Episode 4 - "Wild Wild Pest"
Jase and the guys utilize their skills at removing pests from other people's property; Sadie and John Luke are offered summer jobs at Willie's diner, but must first undergo training to become good employees. 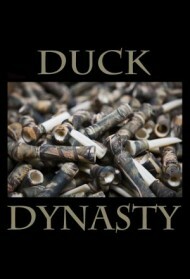 Season 8, Episode 3 - "Search N' Decoy"
Jase and the guys repaint old duck decoys in an attempt to trick Phil; Willie takes on Kay's club in a bowling challenge. Season 8, Episode 2 - "Induckpendence Day"
Jase and the guys plan a fireworks extravaganza for the Robertson family's Fourth of July barbecue; Uncle Si becomes the subject of an exhibit at a local military museum. Season 8, Episode 1 - "Grooming the Groom"
The guys take John Luke golfing and dispense marital advice prior to his engagement party; Kay and Si tag along when Kori shops for engagement presents. Season 7, Episode 11 - "Making the Musical"
Season 7, Episode 10 - "Sweet Home Louisiana"
When Jep and Jessica move into Willie and Jase's neighborhood, Jep is sidelined with an illness, causing Willie and the Robertson family to pitch in and help Jessica get her new house ready in time for Jep's arrival home. Meanwhile, Jase and the guys visit a redneck auction to find Jep the perfect housewarming gift. Season 7, Episode 9 - "Master and Duck Commander"
When Jase and the guys transform an old pontoon boat into a floating duck blind, they are faced with the impending question of whether or not it will actually float. Meanwhile, when Kay's dog Bobo misbehaves, Willie signs Kay and Bobo up for a doggie obedience class. Season 7, Episode 8 - "Friday Afternoon Lights"
When Willie becomes an assistant coach on Lil' Will's struggling football team, his authority is tested when the kids challenge the adults to a scrimmage. Meanwhile, Kay brings Jep and Si to an aquarobics class at a local health club. Season 7, Episode 7 - "Coop! There It Is!" When Jep asks Willie and the guys to help move his old chicken coop into his new house, which is under renovation, Jessica takes issue with its appearance, leading the guys to yet another project -- renovating the chicken coop. Meanwhile, Jase and Uncle Si take some of the kids jug fishing, but when Uncle Si drinks too much expired soda, his behavior gets crazier than usual, much to the kids' delight. Season 7, Episode 6 - "Mo Math, Mo Problems"
Willie helps Sadie with her homework by enlisting the guys to create a real-life version of a math problem, but when Jase and Willie get sidetracked helping Sadie, they rekindle an old argument of whether Jase can outrun a truck, and decide to test out the theory on the streets. Meanwhile, Si helps Kay and Phil write a contract about Kay's compulsive hoarding. Season 7, Episode 5 - "The Cannonball Runs"
Jase enters an outhouse race to help promote Willie's Duck Diner, but when the Robertsons show up for the race, they face an unexpected rival -- Phillip McMillan. Meanwhile, Willie attempts to create the world's greatest bologna sandwich for his Duck Diner menu, and enlists the help of the ladies to be his "taste testers." Season 7, Episode 4 - "A Home for the Holidays"
The Robertsons help a long time employee whose Mom has fallen on hard times by buying her a brand new house for Christmas. Jep, Jase, Martin and Godwin race to finish a deck in time for the big reveal, only to get sidetracked by a hammering competition. Meanwhile, Phil and the ladies prepare a holiday meal, while Willie goes to a local recording studio to create a Christmas song, but is annoyed by Kay and Si's constant interruptions. Season 7, Episode 3 - "Quack in the Saddle"
Season 7, Episode 2 - "Good Night and Good Duck"
A special holiday episode of Duck Dynasty shows when the Robertson family took over the Thanksgiving special of a local TV show "Good Morning Arklamiss." Each family member presents a special holiday segment, with Willie and Jase serving as anchormen, Si as the weatherman, Kay presents her famous Thanksgiving recipes and the rest of the family offer up their unique tips for the holidays. Season 7, Episode 1 - "Glory is the Reward of Mallard"
Willie goes on a business trip to Scotland in the Season 7 premiere. Meanwhile, Jep and Jessica plan a romantic getaway. Season 6, Episode 10 - "Please delete me"
Season 6, Episode 9 - "Lake Boss"
Stumped on a way to celebrate Willie's birthday, Korie enlists the guys' help and Jase takes the reigns in planning a trip to the lake where Phil and Kay used to live. Meanwhile, when the women realize a raccoon is inside the lake house, they ask for Phil to take care of the problem and he enlists the help of his grandkids on a search for the critter. Season 6, Episode 8 - "Return of the Beavers"
When Phil discovers more beaver activity on the Robertson land, he recruits Jase, Jep, and Si to get rid of them. Meanwhile, Willie and Korie bring Bella to her first day of karate practice, but when Willie tells the instructor that he always wanted to learn karate, he is invited to join the class for the day. Season 6, Episode 7 - "Men vs. Wild"
Brotherly competition is taken to a whole new level when Jase and Willie challenge Alan and Jep to a survival race through the woods on Phil's property. Meanwhile, Si is interested in finding a new hobby when he sees Kay cutting coupons, so the two join forces to set out on a couponing excursion. Season 6, Episode 6 - "De-Bug Life"
The guys realize it is time for the annual cleaning of the duck blinds when they come across a gator using one as a home. Meanwhile, while the kids are running the church car wash, Si and Willie disagree on the best way to draw in customers. Season 6, Episode 5 - "Brand of Brothers"
When Willie contemplates re-branding the Duck Commander image, Jase takes issue with having an outsider design their image, so he and the guys create their own new logo and business cards. Meanwhile, Willie and Phil help Bella with her science project, so Phil takes this chance to teach his granddaughter about nature, and ends up teaching her more than Willie was hoping. Season 6, Episode 4 - "Quackdraft"
When the Robertsons participate in the West Monroe Fire Department pancake breakfast, the firemen invite Willie and his brothers to train with the department for the day. Meanwhile, Phil and Si accompany Miss Kay on a trip to visit a family grave, but Phil becomes uneasy when Kay begins to look at burial plots for their own final resting place. Season 6, Episode 3 - "Hands on a Woodchipper"
When Willie agrees to sponsor Mountain Man's radio contest, a "Hands on a Hardbody" competition, he somehow finds himself competing against Si for Mountain Man's last minute prize: a woodchipper. Meanwhile, Jep and Jessica chaperone Lily's first "date," mini golfing with a boy from her school and Jep goes into over-protective dad mode. Season 6, Episode 2 - "Quack and Gown"
With Reed's graduation day approaching, Jase decides to take Reed frog hunting the night before, like he did on the day of his own graduation. Willie and Si join in, and Jase tries to keep them from imparting their "college advice" on Reed. Meanwhile, Korie, Jep, Jessica and Kay pull a senior prank of their own by toilet papering Missy and Jase's house. Season 6, Episode 1 - "Governor's Travels"
When the Governor of Louisiana announces that he will be coming to Duck Commander to present Willie with a commerce award, John Luke volunteers to give the introduction speech. But Willie can't help but give John Luke some public speaking pointers, along with Si's unwanted help. Meanwhile, Miss Kay enlists Korie and Sadie's help to pick out a nice outfit for the visit, trying to convince a reluctant Phil to give his opinion on her outfit options. Season 5, Episode 10 - "Stand by Mia"
Season 5, Episode 9 - "The Big LeCOWski"
Season 5, Episode 8 - "Fowl Playhouse"
Season 5, Episode 7 - "Jase and the Argonauts"
Season 5, Episode 6 - "G.I. Si"
Season 5, Episode 5 - "Burger Commander"
Season 5, Episode 4 - "From Duck 'Til Dawn"
Season 4, Episode 13 - "Life of Si"
Season 5, Episode 3 - "Life of Si"
Season 4, Episode 12 - "TBA"
Season 5, Episode 2 - "Willie's Number Two"
Season 5, Episode 1 - "Boomerang Becca"
Season 4, Episode 11 - "O Little Town of West Monroe"
Season 4, Episode 10 - "Quack O'Lanterns"
The Robertsons host their church's annual trick-or-treat event at the Duck Commander warehouse; Miss Kay gets the children to help decorate the house; Phil creates a jack-o'-lantern with a twist. Season 4, Episode 9 - "Going Si-ral"
Season 4, Episode 8 - "Jerky Boys"
Season 4, Episode 7 - "Scoot Along Si"
Season 4, Episode 6 - "John Luke After Dentist"
Season 4, Episode 5 - "Termite Be a Problem"
Season 4, Episode 4 - "A-Jase-ent Living"
Season 4, Episode 3 - "Hot Tub Grime Machine"
Season 4, Episode 2 - "So You Think You Can Date?" Season 4, Episode 1 - "Till Duck Do Us Part"
Season 4, Episode 0 - "Sneak Peek"
A preview of Season 4. Season 3, Episode 13 - "Aloha, Robertsons!" Season 3, Episode 12 - "Battle of the Brothers"
Season 3, Episode 11 - "Si-amese Twins"
Season 3, Episode 10 - "Bass Man Standing"
Season 3, Episode 9 - "Ring Around the Redneck"
Season 3, Episode 8 - "Duck Be a Lady"
Season 3, Episode 7 - "Tickets to the Fun Show"
Season 3, Episode 6 - "Let's Go Hunting, Deer"
Season 3, Episode 5 - "Hallu-Si-Nations"
Season 3, Episode 4 - "Here Lizard, Lizard"
Season 3, Episode 3 - "Shot Thru the Heart"
Season 3, Episode 2 - "Can't Hardly Weight"
Season 3, Episode 1 - "Duck Season Eve"
Season 2, Episode 13 - "I'm Dreaming of a Redneck Christmas"
Season 2, Episode 12 - "Drag Me to Glory"
Season 2, Episode 11 - "Duck No We Won't Go"
Season 2, Episode 10 - "Of Matresses and Men"
Season 2, Episode 9 - "Samurai Si"
Season 2, Episode 8 - "Good Morning, West Monroe"
Season 2, Episode 7 - "Spring Pong Cleaning"
Season 2, Episode 6 - "Sweatin' Bullets"
Season 2, Episode 5 - "Fowl Play"
Season 2, Episode 4 - "Si'yonara"
Season 2, Episode 3 - "Truck Commander"
Season 2, Episode 2 - "Driving Miss Sadie"
Season 2, Episode 1 - "The Grass & The Furious"
Season 1, Episode 15 - "Willie Stay or Willie Go"
Season 1, Episode 14 - "Winner, Winner Turkey Dinner"
Season 1, Episode 13 - "Redneck Roadtrip"
Season 1, Episode 12 - "Fishin' for Business"
Season 1, Episode 11 - "Daddy's Got a Gun"
Season 1, Episode 10 - "Plan Bee"
Season 1, Episode 9 - "Sauvignon Beard"
Season 1, Episode 8 - "A Big Duck-ing Call"
Season 1, Episode 7 - "Leave It to Beavers"
Season 1, Episode 6 - "Too Close for Comfort"
Season 1, Episode 5 - "Redneck Logic"
Season 1, Episode 4 - "Frog in One"
Season 1, Episode 3 - "High Tech Redneck"
Season 1, Episode 2 - "CEO for a Day"
Season 1, Episode 1 - "Family Funny Business"